January 16, 2019 By Allyson 19 Comments This post may contain affiliate links. Read my disclosure policy. Whenever we go to a Thai restaurant, I have to order the Coconut Soup; It’s magically delicious!!! 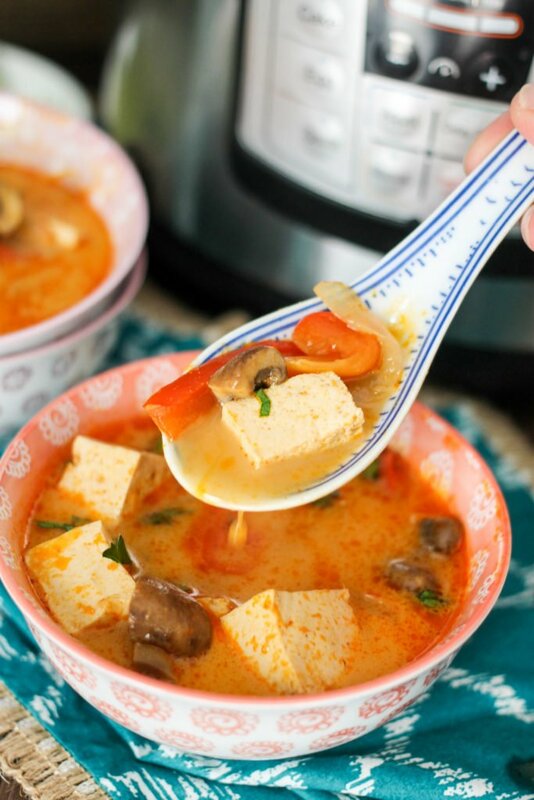 So creamy, yet slightly spicy and sweet, it’s amazingly tasty and I crave it all the time. For a long time I thought the authentic Thai flavors were difficult to recreate at home, but I was wrong, it’s actually very easy when you have the right ingredients. 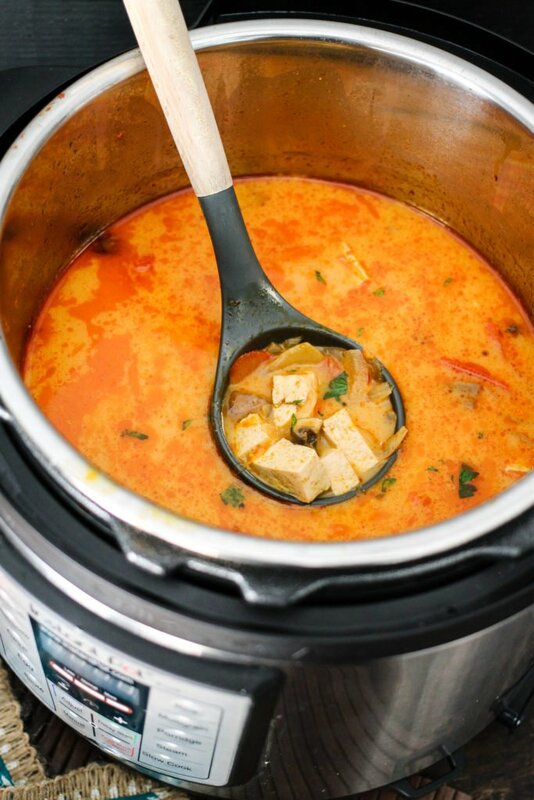 This Instant Pot Thai Coconut soup only takes 4 minutes to cook in the instant pot (plus the time to come to pressure etc), and turns out fantastic. I like using tofu in my coconut soup, but a lot of people enjoy the soup with chicken, so I will include those instructions below as well. 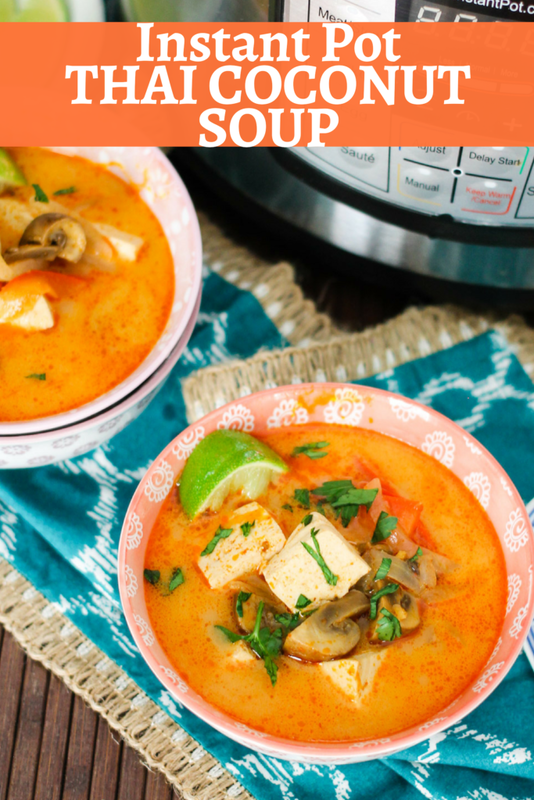 You are going to LOVE this comforting Instant Pot Thai Coconut Soup! If you like Thai food, you should also checkout One Pot Thai Noodles, Instant Pot Thai Lettuce Wraps and Spicy Thai Chicken Tenders! Using a 6 or 8 quart Instant Pot, heat it up using the sauté function. Add the oil, onions, and peppers and sauté . If you are going to add chicken, this is when you should do it. Add the sliced chicken to the pot with the onion and peppers, and sauté for about 3-4 minutes. Add the mushrooms, and stir. Add the brown sugar, ginger, curry paste, fish sauce, lite soy sauce and stir some more. If you are using TOFU, add it now. Make sure you DRAIN (see below for directions) your tofu before putting it into the pot. Add the broth, close the top of the pot, seal the pressure valve, and set on manual/high for 4 minutes. You should remember when using the Instant Pot, that the time it takes to cook the recipe (4 mins), is not the total time of the recipe. You need to give the pot some time to ‘come to pressure’. With a soup this will take a bit of time since there is a lot of liquid, probably 10-15 minutes. Once it comes to pressure the pot will beep and the time will begin counting down. Once the time is up, let the pressure release naturally for 5-10 minutes, then flip the valve to release the remaining pressure (careful some liquid may spout out). Remove the top carefully. Add lime juice, coconut milk, and sriracha to taste. Stir everything to combine. Serve the soup and garnish with lime wedges, cilantro, or anything else desired. Enjoy! It’s important to drain the tofu before using it. This will allow the tofu to absorb the flavor of whatever you are cooking it with; in this case the Thai coconut flavor. Flavorless tofu is not good tofu, so make sure you don’t skip this step if using tofu. Using firm or extra firm tofu, remove from package and discard the water in the package. Cut the tofu block in half long ways, so you make the block thinner. Place 1 folded clean dish towel or paper towels down on the counter. Set tofu halves next to each other on top of the towels. Add another 1-2 towels on top of the tofu. Place a cutting board on top of the towels, then add a lot of weight to the top of the cutting board. I typically use a few cast iron pots or pans. Let it sit for at least 20 minutes, then remove the weight, towels, and cut the tofu into bite sized cubes. If you like tofu as much as I do (delicious when cooked correctly) then checkout my popular General Tso’s Tofu and Crispy Honey Sesame Tofu recipes! 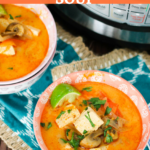 Is Instant Pot Thai Coconut Soup Healthy? Nutrition info for CHICKEN (no tofu): 215 calories, 10g fat, 6g saturated fat, 13g carbohydrates, 2g fiber, 7g sugar, 17g protein. Weight Watchers Points: Tofu version contains 8 weight watchers points per serving and the chicken version contains 7 points. The soup also contains 17% of your daily vitamin A and 62% of your daily vitamin C! Instant Pot Thai Coconut Soup is the perfect meal, so doesn’t require any additional side dishes, but if you’d like more options, be sure to try out these delicious Instant Pot Thai Lettuce Wraps, One Pot Spicy Thai Zoodles or Spicy Thai Chicken Tenders! Serving this dish with just some steamed white rice and shelled edamame is a great option as well! Best vegetarian instant pot recipes; From side dishes to main dishes, and a variety of cuisines, there is definitely something for everyone! Heat a 6 or 8 quart Instant Pot, using the sauté function. Add oil, onions, and peppers and sauté 2-3 minutes. **If you are going to add chicken, this is when you should do it (see notes below). Add the mushrooms, and cook for 2 minutes. Add brown sugar, ginger, curry paste, fish sauce, lite soy sauce and stir. Add tofu then broth. Close the lid, seal the pressure valve, and set on manual/high for 4 minutes. Add lime juice, coconut milk, and sriracha to taste. Stir everything to combine. Serve the soup and garnish with lime wedges and cilantro. Enjoy! TIP: You should remember when using the Instant Pot, that the time it takes to cook the recipe (4 mins), is not the total time of the recipe. You need to give the pot some time to ‘come to pressure’. With a soup this will take a bit of time since there is a lot of liquid, probably 10-15 minutes. Once it comes to pressure the pot will beep and the time will begin counting down. 1lb boneless skinless chicken breast, sliced into 1/2 inch strips or bit sized cubes. Add the chicken at the end of step one, with the peppers and onions, and cook. Continue with recipe as written. Omit tofu. Nutrition info for TOFU: 202 calories, 12g fat, 7g saturated fat, 14g carbohydrates, 2g fiber, 7g sugar, 9g protein. This looks incredible! Can’t wait to try it. This looks amazing! I am always looking for easy and quick dinner ideas. I loved this so much! Thank you! We’ve looking to add more vegetarian dinners into our weekly rotation and this looks amazing! Thank you for adding a video to give me the confidence to nail this for dinner. It’s really helpful. I made this soup for dinner and it gets 5 stars in our household! thank you for a great recipe! I will definitely be making this again. My first creation in my new Instant Pot. It was a flavor explosion! My family really liked it. Thank you!! This looks delicious!! Can’t wait to try this recipe. Looks spectacular! Adding to my list of must makes, so tasty and flavorful! This looks very flavorful! can’t wait to make it! This looks so comforting! I really need it right now! Bursting with flavor and very colorful, sounds delicious! Is this vegan or a way to make it vegan ? thanks!! I am 99% sure if you just leave the fish sauce out, it would be a vegan recipe. I think you would be fine to leave it out. Good luck! 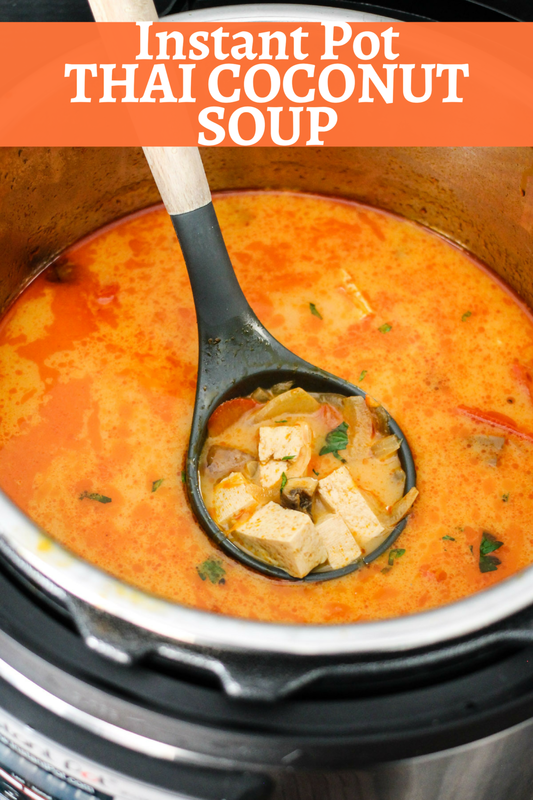 I love finding great recipes like this for my Instant pot! These flavors are going to be fantastic together! Hi! When do you add the 4 cups of broth? It doesn’t say. Hi Jasmine- you add the broth after the tofu. It’s listed in step #2: “Add the mushrooms, and cook for 2 minutes. Add brown sugar, ginger, curry paste, fish sauce, lite soy sauce and stir. Add tofu then broth.” Good luck and I hope you enjoy it as much as we do! Delicious! Even my husband who hates tofu, mushrooms, and fish sauce loves this soup. 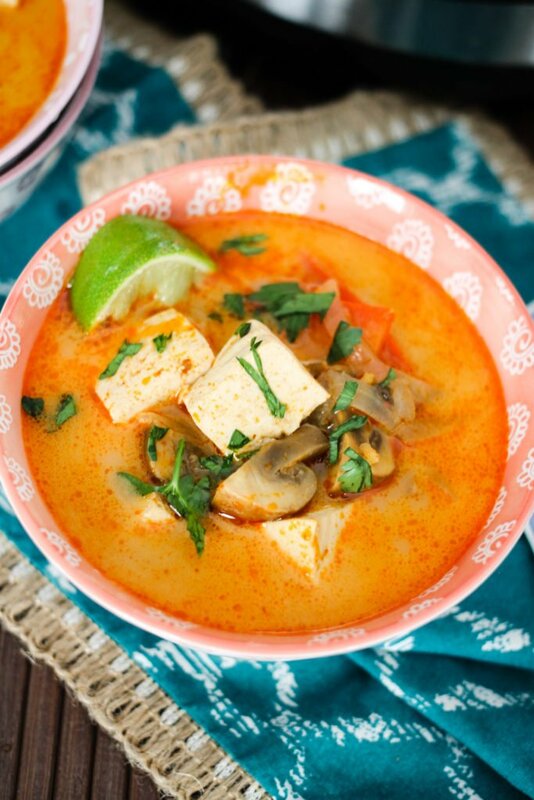 Do you think it would be ok to add the coconut milk before the pressure cooking? That is so awesome!!! I don’t know about adding it before, as I haven’t tried that. I would say, lets not try to fix what’s not broke, right? Going to share your comment with my Facebook page!